Your place for collectible cards! Thanks for visiting this website. 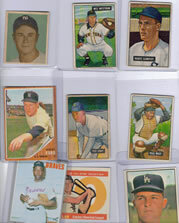 I have been in the hobby of sports,non sports, coins for a long time. Over 30 years of experience. I will be selling non sport cards, baseball cards, autographed horse memorabila, and coins. I will have a coins from Indian head pennies,lincoln pennies,Jefferson nickels, Barber dimes,'Barber quarters,Barber Halves,Walking Liberty halves,washington quarters, mercury dimes, Silver dollars. etc. They will be listed in various grades. All items' prices are negotiable if you are willing to make a reasonable offer! I have been a seller on ebay since June 10, 1998 and have 100% positive feedback!!! Click here to view my ebay account!